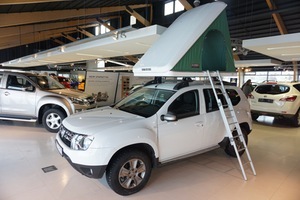 The Dacia Duster 4x4 Camper is very popular for driving around Iceland and also on F-roads. The car is diesel and very economical. No fee for additional drivers and you can drive unlimited mileage! This car is extra equipped for camping* (See More*). Dacia Duster is very popular for driving around Iceland and also on F-roads. The car is diesel and very economical. Included in our prices are Collision Damage Waiver (CDW) insurance and taxes. No fee for additional drivers and you can drive unlimited mileage! The Wind and Waterproof - no treatment is necessary, the material will shed water and the tent can be packed when wet and will not rot or discolor. The Columbus is unique - it´s constructed on an internal sub-frame incorporating an insulating foam sandwich construction. The sub-frame is so strong and light that these tents, unlike other rooftop tents, do not require an expedition basket to support them. They mount directly to standard roof rack cross bars. This insulated design also minimizes condensation under the mattress. If water does get into the tent, it is channeled away from the mattress. – Enjoy your freedom to the fullest while traveling!